For kits, there used to be some by Aeroclub, but are not in their catalogue any longer. There is also the old Rareplanes vac kit, again, long out of production. There is/was a conversion by Tasman for the Airfix/Heller kit as well. For a two seater, I can only think of the Frog kit which has been reboxed by Novo and a dozen other Eastern European companies. All of these are in the usual Dark Green/Dark Sea Grey over either Medium Sea Grey or PRU Blue, depending on the aircraft. The instructions are quite complete in terms of the proper colors to use. The sheet also includes stripes to do the various wing tank banding needed, though you may want to consider painting these stripes as an alternative to using decals as fitting straight decals over the ever-changing radius tanks will be a challenge. It is nice, however, to have the option. 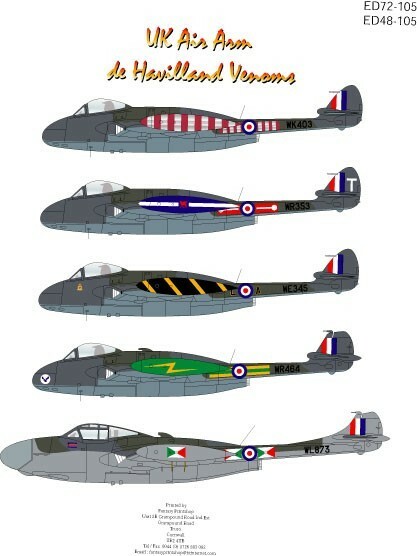 From the looks of things, there are enough insignia to do three aircraft from the sheet. Any other data or warning markings will have to come from the sheet provided by the kit. A small note. I have a lot of trouble reading the small type and would hope that perhaps the font could be increased a bit. Most modelers who will buy these sheets are going to be ones whose eyes are not what they were and I’m sure it would be appreciated. The decals themselves are superbly printed. I did not find any off register and the color is brilliantly done.